By the looks of it, they’ve spend a pretty penny on it to. The scenario – bloke gets new camera phone, shoots a little video with it – in HD natch – and uploads it to video. The hook? 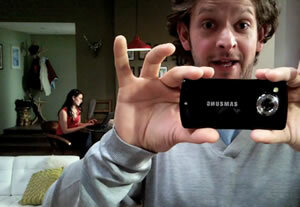 The cameraphone ‘disappears’ during the and you as an avid YouTube/Viral video fan needs to work how how it’s done. We’re told that there’s no edit in the video to add to the confusion. Frankly this must have cost a darn fortune, given the size of the set and the number of times they must have shot it to get the final, one-shot version. We watched it a few times, with an idea of the setup after the first watching. It’s been well done, but once you start looking, additional pointers fall over themselves. Looking at the comment beneath the video we saw that others concurred with our theory. One thought we had – Kind of strange that they suggest people put their guesses below the video, as it ruins any potential mystery. 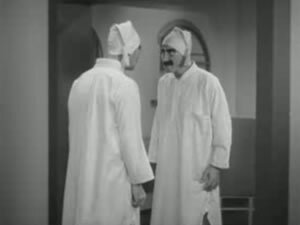 Anyone familiar with the 1933 Marx brothers film, Duck Soup, will have a leg up in figuring it out. Guess it must have worked for the creators, The Viral Factory, in some way – we’ve embedded the video, giving them free advertising.